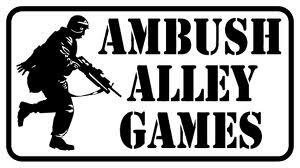 Wee Gamers did an interview with the fellas of Ambush Alley Games. You can check out the interview on the Wee Gamers' website. Wee Gamers were very fortunate to get an interview with Shawn Carpenter from Ambush Alley Games, the creators of Force on Force and Tomorrow's War which are published by Osprey Publishing. In this piece he talks about how the game and the company came about.